Homeowners across the Tri-State have upgraded their backyard barbecue game. They’ve added storage space and sleek counter tops complete with a state of the art built-in grill. 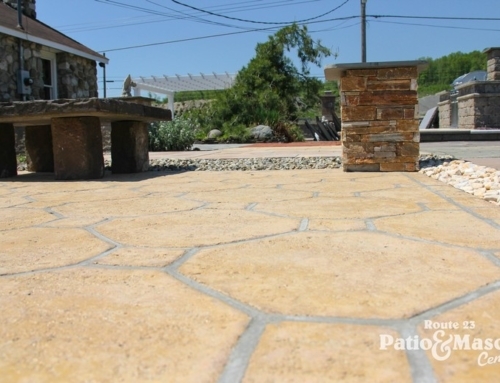 They’re hitting up the guys at Route 23 Patio to get the job done—the outdoor entertaining pros have everything at their supply store in Sussex County, from the individual outdoor kitchen pieces, to the trucks you need in order to move them. Due to the popularity, convenience, and increased demand for outdoor kitchens, homeowners who add them outdoor kitchens can expect a high return on investment when selling their homes. Cooking indoors heats the kitchen up while you’re trying to cool it down with air conditioning. Keep the A/C from having to work extra hard to keep the temperature down by moving the cooking outside. Grilling makes your food tasty—without all of the added fat you’d be using if cooking indoors. 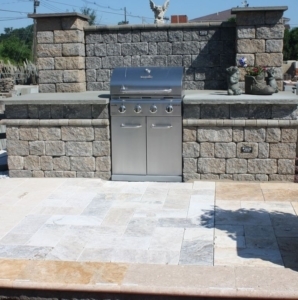 The outdoor kitchen makes each step of party planning a little easier. For pre-party meal prep, the extra-spacious and open outdoor kitchen keeps you from bumping into others who are trying to help set up. During the fete, it’ll also save you endless trips in and out of the house to get food. Afterwards, cleanup is much less of a pain because anything that spills onto the floor (barbeque sauce, veggie trimmings…) doesn’t need to be swept and mopped. Just grab the hose.